Modern holidays are something more than just a chance for relaxation and leisure; they are an opportunity for personal enrichment. Holidays give us a chance to experience a different way of life and to create a special relationship with the place visited. Only a short 30 km drive from Logroño, the Najerilla Valley is one of my “special places”. It has a number of alluring qualities: amazing landscapes, towns with a long history and great cuisine. More importantly, through blending in with the locals, I’ve learned many things about the region and its traditions, to the point that it has changed my perception of Rioja and its wines. Among these traditions, one of the most interesting is the production of “Clarete” and “Ojo de Gallo”; two local wine styles that are fairly unknown outside the area and rarely make their way to the export markets. Rioja has a contrasting and attractive countryside of undulating hills and sprawling vineyards alongside the region’s main waterway: the Ebro river. The region’s landscape is defined by seven tributary rivers of the Ebro that flow from the Sierras of Cameros and la Demanda forming seven independent valleys. This collection of rivers and valleys is the reason why the area is also known as “the land of the seven valleys”. These have defined the region socially and economically, as the direction of natural and human resources followed the flow of these rivers from the southern sierras towards the more fertile lands of the Ebro basin. The valleys are named after the rivers that run their course through each of them: Valle de Oja-Tirón, Valle del Najerilla, Valle del Iregua, Valle de Leza-Jubera, Valle del Cidacos and Valle del Alhama-Linares. All of them have their special features and individual attractions yet, among them, my favorite is the Najerilla river valley. Away from the more trodden paths of Spain’s flagship wine region, this wooded valley sprinkled with vineyards offers amazing history, great examples of Romanesque, Gothic and Renaissance architecture, a great river for rainbow trout fishing and a network of paths surrounded by vineyards ideal for hiking. 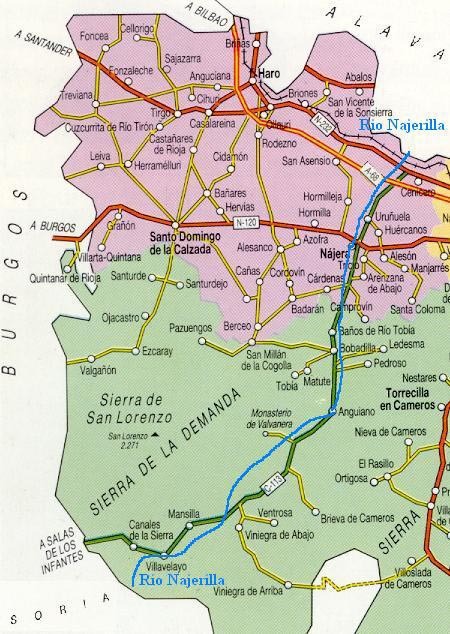 The area owes its name to the town of “Nájera”, capital of the Kingdom of Navarre in the 11th century AD and, historically speaking, one the most important settlements in the area. Its medieval town center, busy tapas bars and the monastery of Santa María La Real, certainly make it worth a visit. The upper valley is home to the world heritage monasteries of Suso and Yuso (considered the birthplace of Castilian Spanish) and, interestingly, of Rioja’s fairly unknown “Clarete” and “Ojo de Gallo” style wines. Despite the fact that the town of San Asensio is considered the official capital of “Clarete” and on every year since 1977 revelers meet in the “barrio de las bodegas” (winery district) to literally bathe in the stuff during the “Battle of Clarete”; its the villages in the upper Najerilla Valley like Cordovín and Badarán where one can drink some of the best examples of this wine style, fairly unknown outside northern Spain. “Clarete” must not be mistaken for the French “clairet”; as opposed to its French counterpart, Rioja’s style is made from fermenting a mix of mainly white –usually Viura- and a small portion of red grapes together –preferably Garnacha tinta-, resulting in a pale colored wine. Produced for local consumption by small “bodegas de cosechero” (literally, harvester’s wineries) they were coveted for their fresh and crisp, highly quaffable style by bar punters in the cities of Zaragoza, Bilbao and Soria. Today, many modern wineries still produce this style and its quite common among local consumers. It rarely reaches export markets because its prone to oxidation and would not reach the international consumer in the pristine conditions of freshness that make it attractive. “Ojo de Gallo” is something else; a much more obscure wine style that I have only recently had the chance to taste, despite having been actively looking for it for quite some time. It was in the town of Badarán during an ‘aperitivo’ when I noticed a group of the older locals were drinking a very thin and faded red that seemed to capture their conversation. When I heard to magic words “Ojo de Gallo” I couldn’t help myself and asked for a try. While sipping on it and admiring its light freshness, I asked how it was made: “El Ojo de Gallo no se hace, el Ojo de Gallo sale” (Ojo de gallo isn’t made, ojo de gallo happens”) was the answer. The name and the style have a history I will try to loosely transcribe: Long ago (when winemaking technology wasn’t as widely available as it is today), when devatting their wine, local grape growers discovered that, sometimes, one of the tanks would have a lighter colored red. This wine was very low in tannins and had a very special color that reminded them of the color of a “rooster’s eye”, literally, “ojo de gallo”. The origin of the color and style difference is apparently unknown. Things like the different levels of ripeness of the grapes in the vat, a very short maceration in contact with the grape skins or insufficient fermentation times, were mentioned during the conversation, as well as altitude of the vineyards, weather conditions or the use of grape varieties (mainly garnachas and viuras) different from the high yielding clones of Tempranillo that are the norm among growers today. The fact is that these wines are hard to find even for the locals. If available, they will be usually reserved for fast consumption among family and friends. As I listened to the debate that I had sparked among my incidental companions, I smiled. It felt good to be a part of this group of old friends for a glass of wine and some good conversation even if only for a little while.